It seems that most of my impulse buying has been baking-related lately. First, I impulsively bought dark cocoa powder, because why not? I love dark chocolate. Then a few weeks ago I saw the most awesome Halloween cupcake liners and impulsively bought them too. 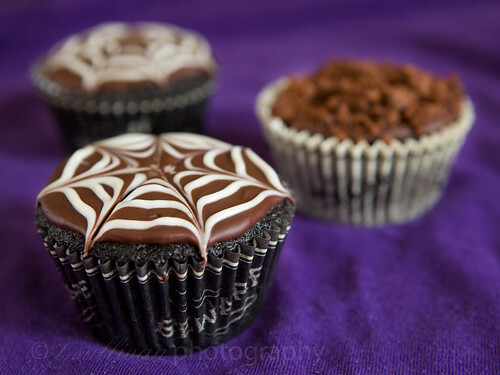 And that’s how I ended up with dark chocolate Halloween cupcakes to share! The liners were so cute I just had to decorate the cupcakes to match. The spider cupcake liners that say “Beware” around the sides were decorated to look like spiderwebs (easier than it looks! 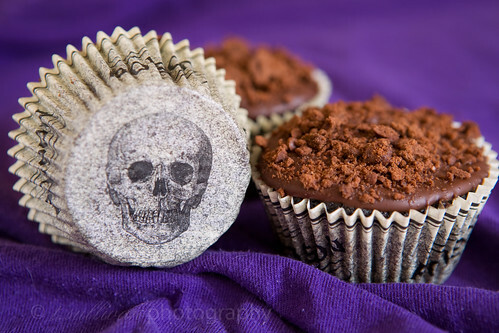 ), and the skull cupcakes liners that say “Poison” were topped with chocolate cookie crumb “dirt”. I had initially planned to add gummiworms to the dirt, but the chocolate ganache icing wasn’t sturdy enough to hold them up. The dirt cupcakes would look great with a cookie tombstone or a zombie hand cupcake topper – your imagination is the limit! These cupcakes are dark. Very dark. Not for the faint of heart. They’re a little bit mysterious too, which makes them the perfect choice for Halloween. At first bite, you’ll taste dark rich chocolate. After a moment, a hint of spices will come through, not enough to overwhelm the chocolate but enough to make you think, “Oh, that’s different”. Not very sweet at all and a little bit creepy, these are the perfect grown-up Halloween cupcakes. As written, this recipe makes very dark chocolate cupcakes. If you don’t like dark chocolate, substitute regular unsweetened cocoa powder in place of the dark cocoa powder. And if you don’t like spices, you can omit them completely to get a really good plain old chocolate cupcake. Preheat oven to 350°F. Line a 12-cup pan with cupcake liners. In a saucepan over medium heat, bring butter and coffee to a simmer. Remove from heat and stir in cocoa powder. Set aside to cool. In a medium bowl, whisk together flour, sugar, baking soda, spices and salt. In a large bowl, beat sour cream and egg together with an electric mixer or by hand. Stir in vanilla. Add the coffee mixture in small amounts, beating constantly, until combined. Add flour mixture and beat slowly until just incorporated. Divide batter evenly among 12 cupcake cups, filling each about 2/3 full. Bake at 350°F for 15-18 minutes, or until a toothpick comes out clean. Cool cupcakes on a rack before icing. Make this icing when you’re ready to use it and work quickly. It’s almost straight chocolate, so it will eventually harden at room temperature. Place the chopped chocolate in a heatproof bowl over a pan of simmering (not boiling!) water. Heat, stirring occasionally, until melted. Remove bowl from heat and set aside to cool for about 5 minutes. With a spatula, stir the confectioners’ sugar into the warm chocolate. Add a few pieces of butter at a time, stirring to combine, until all are incorporated. Once cool enough to be spreadable, dip cupcake tops in the ganache to ice, or carefully spread it across the tops using a spatula. Heat chopped white chocolate in microwave for about 45 seconds on 70% power. Stir. If not melted, microwave in 10 second intervals at 70% power until melted. Fill a plastic sandwich bag with the melted white chocolate and snip a tiny bit of the corner off to make a piping bag. Working quickly (because it’s chocolate and will eventually harden), ice the cupcakes with chocolate ganache icing. While still warm, pipe a spiral of white chocolate on top of the iced cupcakes, starting in the center and working outward. Drag a toothpick through the icing and spiral, from the center of the spiral to the edge of the cupcake, to create a spiderweb design. Alternately, top iced cupcakes with cookie crumbs to create “dirt”. These are beautiful! Very artistic. The recipe looks great too-sour cream, coffee, and those warm spices make for a great cupcake. 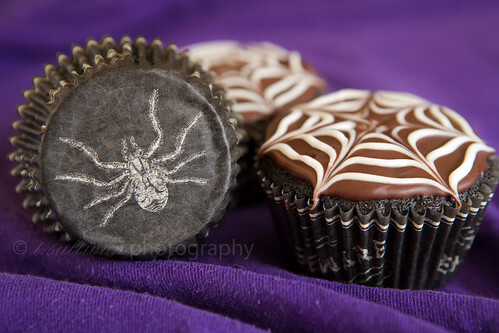 Those spiderweb cupcakes are gorgeous! I’m WAY behind on my blog reading, and starting to catch up tonight. This is one of the first places I came. :) And now I want to spend all weekend making yummy desserts!